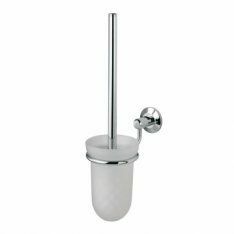 We have wide selection of Toilet Brush Holders, to ensure toilet brushes are constantly within easy reach in your lavatory. Our designs are wall mounted and boast a concealed fixed rose. All the required fixing screws, wall plugs and fixing plates are included to ensure easy installation. Toilet Roll Holders are equally important and should be installed into toilet facilities in both domestic and commercial buildings. Having these in place will make the process of accessing toilet roll both smooth and methodical. In order to ensure you have fresh and clean towels ready for use after a shower, you will need to have any of our high-quality Towel Rails in place. All of our models are part of the LV, LW or LX bathroom ranges and come with a 10-year mechanical guarantee. Towel Rings are a similar concept that have been specially made for small hand towels. We have two bespoke designs that have been made from polished chrome and satin stainless steel. Soap also needs to be stored neatly within bathrooms in order to achieve a clean and tidy atmosphere. We have two Soap Dishes & Dispensers available in the form a Steel Soap Dish and a Triangular Soap Basket. We also have a selection of Tumbler & Toothbrush Holder designs. This will ensure that toothbrushes can be stored neatly together, ensuring your bathroom remains uncluttered. Robe Hooks are a simple and effective method of keeping your bathroom robes neatly stored. We have both single and double hook designs that have been made from high-quality materials like stainless steel and polished chrome. Bathrooms are likely to have a wide selection of bathroom essentials and equipment. This can be stored in an orderly fashion within any of our Bathroom Cabinets. We have both single and double sized cabinets, depending on the amount of space you require. Mirrors are also in sure supply at Ironmongery Experts. We have a multitude of deigns that suit a wide selection of bathroom related tasks. If you want to apply makeup, you will need one of our pedestal models, whereas our larger sized designs allow you to see full reflections of yourself. Glass Shelves & Storage are also available, providing you with another simple and effective method of storing bathroom equipment. We have three different designs that have been manufactured with stainless steel, polished chrome or clear glass. If your bathroom has a shower cubicle, you will need to mount a strong and reliable Shower Curtain Rail. We have both straight and curved designs that are simple to install and have all the required fixings included. You will then be able to attach one of our Shower Curtains & Rings. Our designs are machine washable and have been made with Proseal coated fabric to provide outstanding water repellency. All of our curtains come with an extra heavy cling resistant weighted hem. If your household is occupied by elderly people, you will need to install any of our Grab Rails. This will ensure people have something strong and sturdy to grab hold of as they are manoeuvring themselves out of bath tubs. Finally, we have Pull Out Airers to help support clothing as it’s being dried. Our deigns can be used in either inside or outdoor balconies and sit flat against the wall when they are not being used.